1 of 3 In a glass bowl or large resealable plastic bag, combine vinegar, olive oil, lemon juice, parsley, garlic, shallot, oregano, red pepper flakes and sugar; stir to mix well. Add chicken; toss to coat. Cover and refrigerate 1 hour. 2 of 3 Heat broiler. Coat broiler pan with nonstick spray. Broil chicken for about 3 minutes per side or until internal temperature registers 160 degrees F on an instant-read thermometer. 3 of 3 Spread wraps with mashed avocado, dividing equally. Place chicken in center of wrap and top with lettuce. 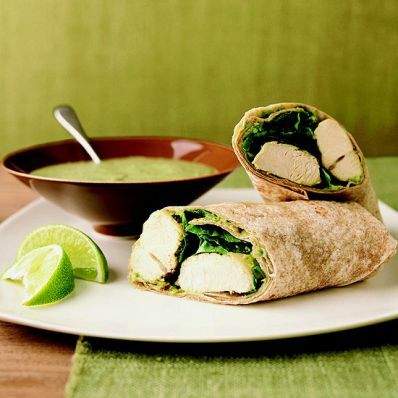 Drizzle with 2 tablespoons Cilantro Mint Sauce, and fold the left and right sides of the wrap in to the center, followed by the bottom, then top, sides. Cut in half and serve.